Because the antique and vintage wedding rings we've offered over the years weren't mass produced, it's safe to say they're unique, and once-in-a-lifetime purchase opportunities. Once an antique ring is sold, you likely won't ever see another like it. Until now. Many of our customers have asked for designs similar to the antique rings we sell, so we've created this collection of vintage inspired wedding rings that incorporate antique style with contemporary flair. Why Choose a Vintage Style Wedding Ring? 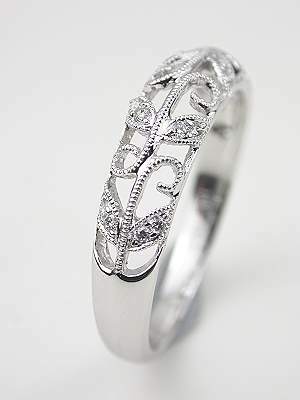 Vines and leaves meander half way around this vintage style leaf motif wedding ring. The leaves and vines of this 18k white gold wedding ring are trimmed in milgrain and accented with a collection of sixteen round brilliant cut diamonds. This is the complimentary band for engagement ring style RG-3169. 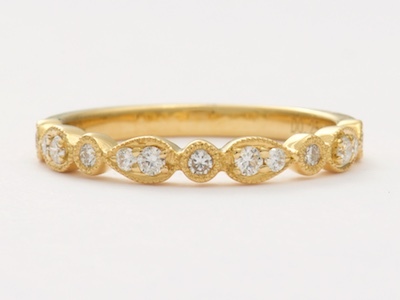 Vintage style wedding rings like this one are also perfect to wear alone or to stack with other bands. 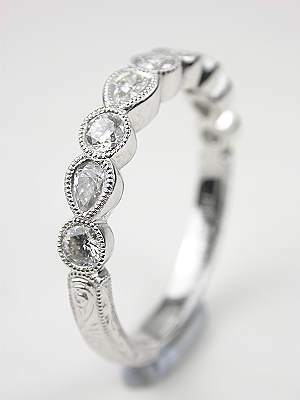 This wedding band has a diamond lace motif like the design on the matching engagement ring, style RG-3276. This is a vintage style (new) wedding ring. Thirteen diamonds in a shared prong design make a glittering statement on her wedding ring finger. The thirteen round brilliant cut diamonds that encircle the outer half of this wedding band total 0.64 carats. The diamonds are VS2 in clarity and range in color from G to I. The 18k white gold band of this wedding ring is polished to a high sheen. This is a new diamond wedding ring. 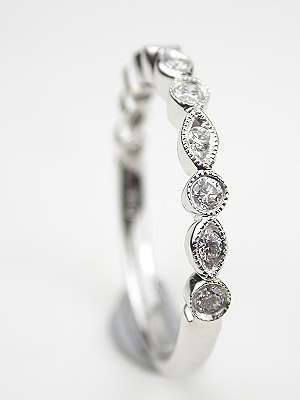 A playful arrangement of geometric shapes gives this antique style diamond wedding ring interest. The smoothly polished 18k white gold of this antique style ring culminates in a stream of diamond-accented circles and teardrops. The eleven round brilliant cut diamonds that accentuate them total 0.22 carats. 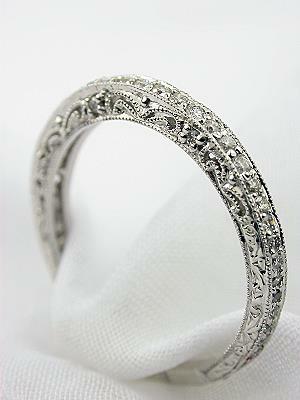 This is a new diamond wedding band in the antique style. 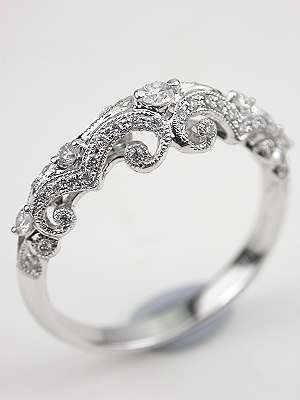 Paisley filigree swirls and mille grain enhance the design of antique style filigree wedding rings like this one. This 18k white gold ring is elegant worn alone or paired with a filigree engagement ring. Twenty-two round brilliant cut diamonds accentuate the band along the top and shoulders and six additional diamonds add shimmer and sparkle on the sides. In this swirling diamond wedding ring, a trio of diamonds bursts from a dazzling cocoon. Millegrain-crusted swirls encase additional diamonds, trapping points of light in shimmering curves. Crafted in 18k white gold, this new vintage style wedding ring pairs beautifully with engagement rings like style RG-1750. But, with its swirling array of diamonds, it also stands magnificently on its own. 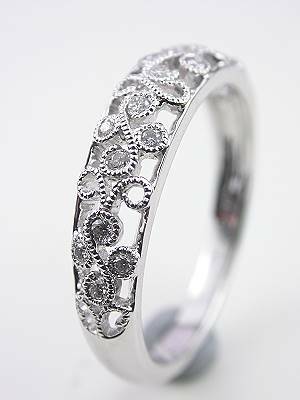 A paisley filigree design accented with round full cut diamonds adorns this fitted wedding band for engagement ring style RG-2567. 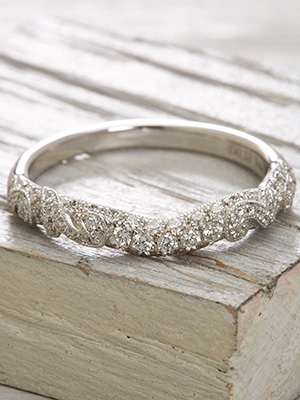 This antique style wedding ring is made in 18k white gold with 0.18 carats of diamonds. It is designed to fit snug against the engagement ring. This is a new wedding ring. 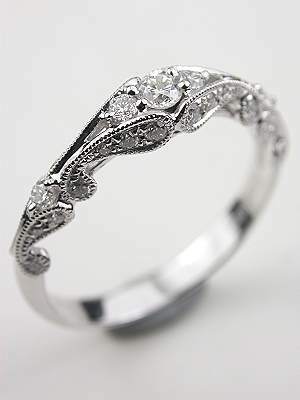 Diamonds, mille grain and fancy cutwork join forces in this filigree and diamond vintage style wedding ring. 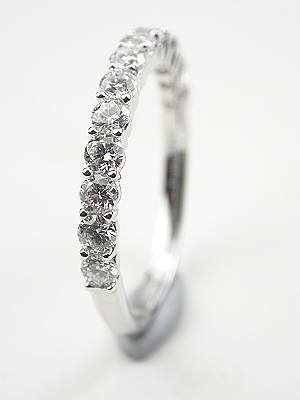 A total of fifty-two round brilliant cut diamonds lend sparkle around the finger in this 18k white gold band. 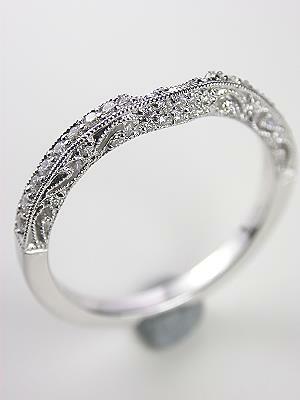 The design is enhanced with intricate beaded scrollwork. This is a (new) vintage style wedding ring. 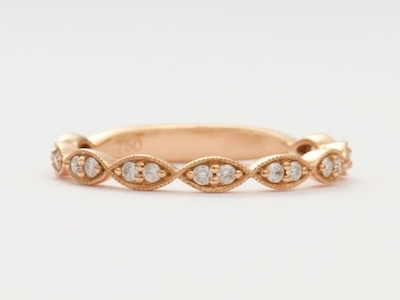 The swirling Vs that highlight this vintage style wedding ring have a playful quality about them. Fifty-seven round full cut diamonds seem to float above the finger and total 0.27 carats. A polished 18k white gold band provides a shimmering back splash. This is a (new) vintage style wedding ring. Like it's matching engagement ring, this vintage style wedding band is draped in festive streamers of 18k white gold and baguette cut diamonds. Mille grain edging lends textural appeal to the scalloped design below each of the baguette cut diamonds. This is a (new) vintage style wedding ring which matches engagement ring style RG-1739. This band may also be worn alone. Endless love manifests in powerful ways. 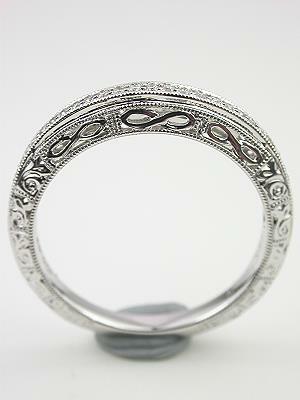 In this vintage style wedding ring, eternal love is symbolized by an infinity motif set in 18k white gold. And it’s celebrated by an endless stream of gleaming diamonds—26 of them—flowing around the outer edge of the band. Curved ever so slightly, this band is a perfect fit for its matching engagement ring, style RG-2814, for a truly elegant bridal set. Delicate mille grain accentuates the design creating a timeless band. In this antique style engagement ring, pear cut diamonds alternate with round diamonds to create a shimmering half circle around the finger. 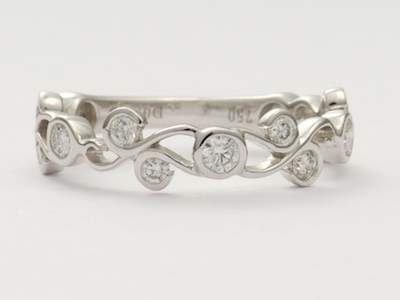 Delicate teardrops and circles come together in this romantic Art Deco inspired wedding band. Each of the nine geometric elements is accented with a diamond. This is a new wedding band in the antique style. Like a garland of roses, this square cut ruby eternity band encircles the finger in brilliant color. In this ruby wedding ring, a collection of forty-five square cut rubies winds its way all the way around the 18k white gold anniversary style band. 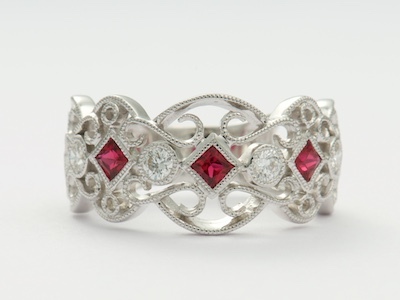 These ruby accents are trimmed in milgrain, a detail that adds textural interest to this eternity band. The rubies have a combined gemstone weight of 1.06 carats. 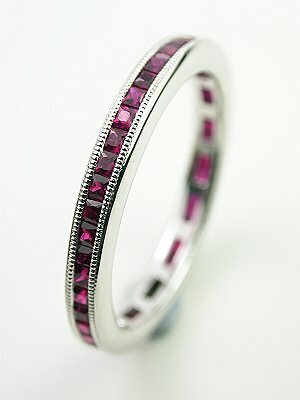 This is a new ruby eternity ring. This ring is available by special order for $1749.00. Email us for more info. This antique style wedding ring, with vine and leaf motif, wraps the finger in a glittering garden array of vines and leaves. 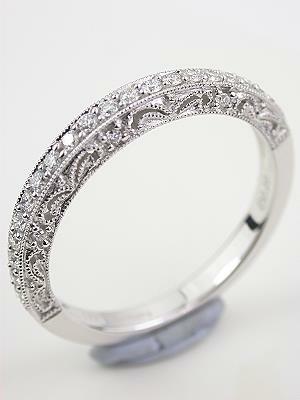 The top half of the 18k white gold band is trimmed in milgrain and set with 16 round full cut diamonds. These diamonds total 0.21 carats. The lower half of the band is polished to a high sheen. 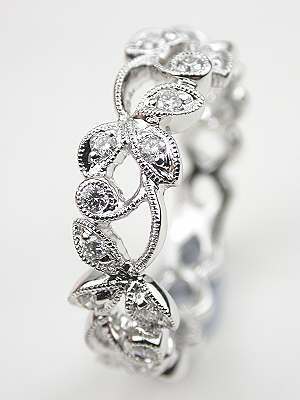 This is a new antique style wedding ring with a vine and leaf motif. If you're considering (or haven't yet considered) an antique or vintage style wedding ring, it may just be the answer to your prayers. Check out these benefits of a vintage style wedding ring. Then you can choose a ring, and focus on the really tough part of getting married--meeting the in-laws. No one else has worn it. Antique rings are beautiful and carry a lot of history with them. But maybe you prefer something that's only yours and no one else's, and that's okay. Sometimes it's nice to have something brand new. Choosing a vintage style wedding ring will give you the style and sophistication of a classic design, while also being another new element of your new marriage and life. It may be less expensive. Let's face it--weddings can be costly affairs. By the time you've booked the venue, chosen the flowers, and selected your dress, your bank account may be a bit strained. 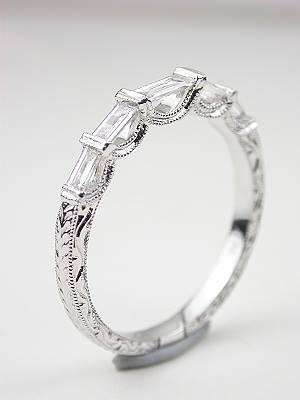 Antique style wedding rings are just as beautiful as their true antique counterparts, but may cost a little less. It can serve double duty. Before diamond engagement rings became a traditional part of betrothal, the wedding ring was often the only ring the bride wore. For this reason, they were often a little more elaborate than simple gold bands. If you're not interested in a flashy diamond engagement ring, but still want something with a little more oomph than a plain band, a vintage-style wedding ring can be the answer. You won't tire of it. A wedding ring is meant to be forever. This is a piece of jewelry you'll be wearing every day for the rest of your life. Are you going to tire of looking at it after a while, or is it going to continue to make your heart flutter decades from now? A vintage-style wedding ring with its intricate design and unique setting will be something you can admire and be happy to wear for the next several decades. Traditionally, in some countries such as the U.S., Italy, and Portugal, married couples wear their wedding rings on the third fingers of their left hands. In many other countries, such as Spain, Denmark, Norway, and Poland, the rings are worn on the same finger of the right hand. Either way, the sentiment is the same--the wedding ring symbolizes a deep commitment. If you're looking for a new wedding ring that is reminiscent of the past, our antique and vintage style wedding rings are a perfect way to seal your vows. Each ring has been hand-selected because it represents the old-world charm you expect from a Topazery jewelry piece. Vintage and antique style wedding rings look and feel just like wedding rings from the Art Deco, Art Nouveau, Victorian, Edwardian, and Retro eras. The stones adorning our collection of antique and vintage style wedding rings range from traditional diamond accents, to gemstones such as emeralds, rubies, sapphires, amethysts, citrines, and more. 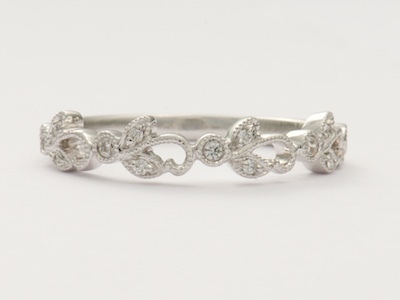 Filigree and open cutwork are just some of the fine detailing you'll notice in Topazery's wide selection of vintage and antique style wedding rings. You'll find platinum, white, yellow, as well as rose gold wedding rings. If you want a new wedding band that evokes the elegance and romanticism of days gone by, an antique or vintage style wedding ring is the perfect choice for you.